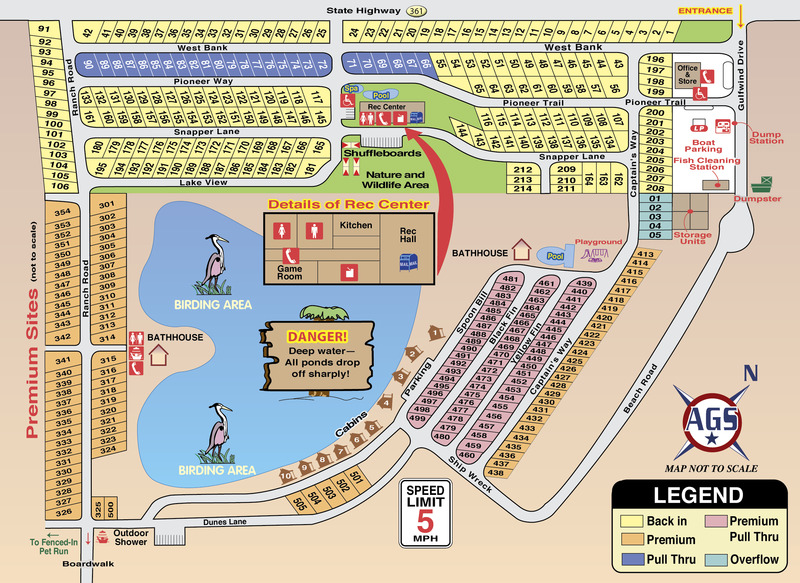 Ask fellow campers about "Pioneer Beach Resort" and nearby attractions. Question: We have our own golf cart but it is not lifted and no big tires. Can we get down to the beach and back on the private trail without getting stuck in the sand at the beach end? Please don't reply and tell me to call the resort. I want to hear from other golf cart owners. Answer: Honestly I’m not sure. We usually rent a gas powered with knobby tires, but the sand is pretty flat. There’s a distance of about 20 yards between the boardwalk and the packed sand on the road that may be hard to get to, but I think it’s pretty flat. Park is fully booked with winter Texans - not sure how we got in but made reservation way last year - sites are a little tight in the area we were in - cable was extra and the WiFi was slow so we used our own Verizon air card - liked the direct access to be beach over the dunes - tons of activities for the winter guests. Was crazy that they only had 8 washers and dryers for almost 400 sites. We enjoyed the bird watching on the lakes, there was a variety of water birds. We camped at Pioneer Beach Resort in a Motorhome. Just finished a three month tour with many pros and a few minor cons. $55.00 is nightly for premium pull-thru close to beach. We paid $625.00 plus electric @.11 KWH on a monthly which includes garbage pickup and use of private mailbox (with $10.00 key charge) that is returned when you give key back at end of stay. Concrete roads and sites with good placement of pedestal, hose bib and sewer drop. Concrete patio with picnic table. IMO pull thrus are a bit tight in the 400 section and back ins in this section are wider but mostly taken by long term folks. Sites in the 300 and 400 areas are closest to the beach. Some buddy sites available in the 481 to 499 section. Private owned golf carts allowed and rentals too. Six seater carts can make the turns on the private boardwalk so no worries there. But you must pay small fee for carts and get sticker. Full time activity directors with things going on morning, afternoon and night if you like with cafe in clubhouse serving meals Friday, Saturday and Sundays. Two swimming pools and one hot tub for you to enjoy. Packages from Amazon delivered to your site by workamper who are friendly. Cons were being charged for another night when over our six years of full timing when we pay for a month it should be a month, whether 31, 30, or 28 days, the last day of the month should be included. Check begin and end dates when you check in. Didn't set well with us. Also long time returnee's have formed cliques here so there could be a pecking order where persons set for doings in the clubhouse. To sum up the pros outweighs the cons and we would return to this park. One last thing. Our site, 463, had electric meters and junctions on the door side of rig which took up a lot of outside space in our site so be aware. Outside kitchen unusable. We camped at Pioneer Beach Resort in a Fifth Wheel. On the beach side of SH 361 so convenient to beach. Three miles to center of Port A. 24 miles to HEB plus and Super Walmart in Flour Bluff. 14 miles to Padre Island and Good n Crisp Chicken which is excellent IMO. Island Cafe in Port A is very good too and fairly priced. Rate reflects a weekly rate, plus electricity. This is my first stay in Port Aransas since Hurricane Harvey. Despite other areas of the town that have yet to be restored, I must say that Pioneer has done a miraculous job of putting the park back together. I agree with others who have observed that the premium pull-thru sites may require some extra maneuvering for larger motorhomes. However, since I am going disconnect my tow car, anyway, it's not a problem. Office staff and grounds folks are very friendly and professional. This is a well-run park. Boardwalk to the beach makes it easy to get there without driving. Daily trash pickup, two swimming pools and a hot tub help make for a pleasant stay. We camped at Pioneer Beach Resort in a Motorhome. As with all of these 'resorts,' the spaces are too close together for comfort, but not as bad as many. Most of the sites are grassy, pads are concrete, staff is friendly and helpful. Avoid most pull-thru sites unless you are just passing thru. Much too close together with small gravel that gets tracked in everywhere. 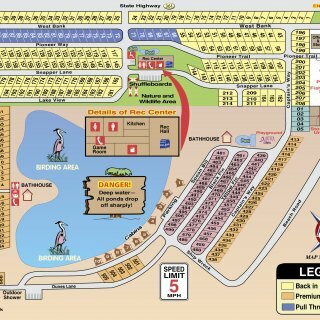 It is a large but easily negotiated campground. Paved streets. Golf cart rules are confusing, as the rules say 'no rental golf carts of any size are allowed' but we had a rental cart as it seems most people do. There is a sticker you need to buy for $30 or $35 that is good for a year. The office has to know about your cart and you get the sticker from them. I heard that if your rental cart is one of those that has advertising or a 'rent me' indication, they are not welcome. You may ride your cart across the boardwalk to the beach and into town. They don't have one of these 'no units over 10 years old' rules, but do stipulate that it must be in good mechanical condition and look nice. Most people here seem to be reasonably long term and there are a very few sites that may be permanently occupied. We would stay here again. Unless you are just staying for a night, your electricity is billed separately. Propane is available. Cable is available. Lots of people wash their cars and rigs at the sites... seems not to be an issue. Very pet friendly. Wi-Fi in the park was quite iffy... sometimes good for quite a spell, then slow as molasses. It seems to depend on which way the wind is blowing. Go to the rec room or laundry for a good connection, but don't count on it in the yard, where it seems more like the old modem connections from years ago. We didn't think the rates were bad: http://www.pioneerrvresorts.com/rates-2/ If you stay more months, you may find a better deal. We stayed for a month at $625 plus cable plus electricity. It is a Good Sam park. We camped at Pioneer Beach Resort in a Motorhome. Beautiful park with sites a short walk from the beach. Friendly, helpful staff; incredible activities directors. Huge variety of activities. Close to the town of Port Aransas and ferry to mainland. Whooping crane festival was great, as well. We camped at Pioneer Beach Resort in a Fifth Wheel. Thought this might help owners of longer RVs trying to decide on staying here. We were here in Jan 18, after most of the hurricane reparations were completed. We are in a 43' Class A motorhome, and stayed in pull-through site #455. Even though the sites are advertised as "pull-through", longer RVs won't be able to drive into these pads and be straight the first time - backing and re-entering will be necessary. 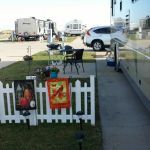 You'll probably find that the other vehicles (cars, trucks, golf carts) parked in front and behind the adjoining sites will complicate entry and departure from your "pull-through" site. To depart our site, the people next door had to move their "golf cart" out of our way, and we had to drive across the grass in their space to get onto the road. Then, we decided to back out to depart the area. We camped at Pioneer Beach Resort in a Motorhome. The first night we were given a premium back-in which was very nice, except for the constant parade of golf carts. Site was concrete with good utilities. Nice grass between sites and spacious. We had to move and was given a standard pull-thru for two nights. That was so objectionable. Site was gravel and extremely close to neighbors. Utilities were acceptable, interior road OK but watch out for the golf carts. It was like the L.A. freeways. The bath house was clean and each lockable shower room had a restroom area. Lots of permanent residents, which are easily identifiable. At check-in, I gave my credit and Good Sam card but the rate didn't reflect the discount. Returned to the office to question the missing discount and was told I would have received the discount if I had shown my Good Sam card. After a little discussion, I was given a credit for the discount. A very large CG and needs a map just to find the exit. Would stay here again, but never, never, never in a standard pull thru. We camped at Pioneer Beach Resort in a Travel Trailer. Make the long trip to Corpus Christi. Gulf Shore. Great experience year after year. It *is* pricey, IMO, given the walk required to get to the beach, and the restrictions on golf carts. More or less everyone here has a golf cart. They were flexible with us when we wanted to stay an extra day by allowing us to move our trailer to another spot. Kind of a pain, but I understand they have a booking system. Restrooms and showers were clean. Sites were a concrete pad and had a picnic table. All in all, a decent place that we have stayed at before, and will again. We camped at Pioneer Beach Resort in a Travel Trailer. The catch is that if you want to rent a cart, you HAVE to do it through a particular dealer. While the service is good from this dealer, it was (at a discounted rate) $135/day (!!) to rent one. If you don't have one, its a 10-15 min walk to the beach across the long boardwalk where you are competing with--you guessed it--golf carts. About 70 percent seasonal campers, a lot are snowbirds. Campground started emptying out the end of April. Charged for cable and washing RV. About a 0.5 mile walk from the campsite to the beach. Try to camp on the road that leads to the boardwalk. No rental golf carts allowed, but just about everyone else had one. 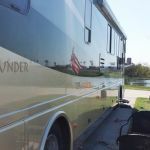 We camped at Pioneer Beach Resort in a Fifth Wheel. Very windy (20 to 30 mph) most of the 8 days we stayed there. Guard your awning especially at night. Golf nearby but expensive ($90). Port Aransas is about 5 miles away. Buy shrimp right off boat at the marina near the town park. We stayed at Pioneer for several days with a rally. We were placed in a premium site. Many attendees were very dissatisfied. Our sites fee was included with our rally fee. Then the park staff comes around and puts stickers on everyone's rig stating that there was an additional $5/night charge over the contracted rate. Rally hall was ok--nothing special. We decided to stay a few days after the rally. When I went to the office the lady said the site was $60 something--I don't remember the amount. I commented that that was a little high. She very rudely said "take it or leave it--it does not matter to me"!!! So, we went back to the rig, hooked up, and left! Our site was spacious with some grass, but many of the sites here are very small and nothing but sand. We will not return to this park, and most of the rally attendees will also never return. We camped at Pioneer Beach Resort in a Motorhome. We were here during Sand fest. From the time we pulled in and we're greeted in the check in area to the time we had to say goodbye, we were amazed. We were escorted to our site by a host. I remember because he gave our puppy a treat. We got set up in out pull thru site which was spacious and spotless. I only went into one of the shower houses and it was very clean for late in the day. There's 2 pools and a spa. I saw there was a large dog run along the entrance to the beach boardwalk. They have a large clubhouse that was being used for a rally. In closing, great staff, exceptionally clean for being full. A definite come back to. Thanks for the dog treats. We camped at Pioneer Beach Resort in a Motorhome. Nice park, the biggest attraction for us was the boardwalk access to the beach. Sites were roomy, level with easy access to the services. Lots of activities for those who wish to join in. Disappointed that the pool was not heated & the hot tub was not working for part of the time we were there. Good free wifi. Town is five minutes down the road but unfortunately do to construction you could not ride your bike. We camped at Pioneer Beach Resort in a Motorhome. Large older park. Sites were tight but with concrete pads. Roads were narrow to navigate with large rig. We had to pay for electricity although only staying for one week. Price was high for what you get but this looks like one of the nicer parks in Port Aransas. This park is on the beach. Sites are only separated from beach by sand dunes and there is a boardwalk in the park to the beach. We camped at Pioneer Beach Resort in a Motorhome. Free ferry off island to Aransas Pass. Rally rate was only for 2 days before rally. Excellent rally room, very friendly helpful staff and clear, well maintained park. I think they allow too much stuff around the full time residences, sites look junky. The sites are very, very tight and the sewer connections are close to neighbors patios. Some sites have gravel between and some have grass. Very well maintained pool and hot tubs. Sewer sites are in different spots at each site, so bring a connection extension. Strong wifi and big cable channel selection. No fire rings or barbecue pits. Park is about 5+ miles west of town, west of Island Moorings Marina. Remember only one grocery store in town, so come prepared. We camped at Pioneer Beach Resort in a Motorhome. This was a really nice RV park, probably one of the best in the area. Very friendly and helpful staff. The residents are also very friendly, many being retired "year round" Texans, as opposed to winter Texans, who I'm sure fill the park during the cold weather up north. Nice recreation hall. They served breakfast & lunch there on weekends during our visit. Nothing fancy, but basic good food. The bathhouse near our loops showed some wear and tear, probably due to the beachfront location and age, but they were clean. We visited during the lull between school starting in Texas and the Labor Day weekend. Apparently after Labor Day, there is even more of a lull until the snowbirds begin arriving. Well stocked store. 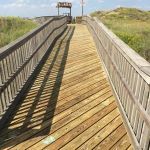 Close proximity to the nice Mustang Island beach, right over the dunes via a boardwalk. We plan on returning. We camped at Pioneer Beach Resort in a Fifth Wheel. Rent a golf cart to reach and ride up and down the beach, even reach "downtown" Port Aransas via the beach. Carts are allowed on the the city streets in a section of the town. Visit to the Texas State Aquarium and the aircraft carrier USS Lexington in Corpus Christi. Many good eateries. Lots to see. It is the beach so bring the sunscreen. The pull-thrus have no grass so our dog had to be walked to the dog park to do his business. Find a site with grass. Port Aransas is a tourist town with lots of shops. HEB is Aransas Pass is the best place to grocery shop. There is an IGA grocery store in Port Aransas with limited selections. Charlie's Pasture is a nice city park to visit for walking/bird watching. Drive the beach, fish from the beach, if into birding get the Port Aransas bird guide and ENJOY, ENJOY. 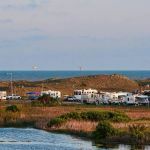 Take a trip to Goose Lake State Park in Portland and the Aransas NWR. If driving around Corpus Christi, go to the Laguna Reef restaurant right on the water, Funktastic! Beach and Station Street Grill--not much to look at outside or in but the food was excellent. The beach is wonderful! USS Lexington is a must see. The ferry to Aransas was helpful, interesting, and free! Best place for drinks is Back Porch Bar close to Woody's. Best value is the fresh shrimp from the Polly Anna at 9am in the park by the ferry. The Corpus Christi shopping area is ~20 miles away; a quick trip down TX361 to the causeway. Are you affiliated with Pioneer Beach Resort ?